Are you interested in tips about how to make performance reviews successful in your organization? While performance review methods and approaches differ from organization to organization, universal principles about how to talk with an employee about his or her performance exist. Whether it’s a performance review, a salary adjustment meeting, or the implementation of a performance improvement plan (PIP), these tips will help you more confidently lead the meeting. These tips are applicable in your daily conversations with employees. They are also critical in your periodic, formal meetings with employees to discuss job goals and performance. These ten tips will help you make performance reviews positive and motivational. They will improve—not deflate—your ability to interact with your reporting employees. The employee should never hear about positive performance or performance in need of improvement for the first time at your formal performance discussion meeting unless it is new information or insight. Effective managers discuss both positive performance and areas for improvement regularly, even daily or weekly. Aim to make the contents of the performance review discussion a re-emphasis of critical points. In the interest of providing regular feedback, performance reviews are not an annual event. Quarterly meetings are recommended with employees. In one mid-sized company, job planning and evaluation occurs twice a year. Career development planning for employees is also scheduled twice a year, so the employee discusses his or her job and career, formally, four times a year. No matter the components of your performance review process, the first step is goal setting. It is imperative that the employee knows exactly what is expected of his or her performance. Your periodic discussions about performance need to focus on these significant portions of the employee’s job. You need to document this job plan: goals and expectations in a job plan or job expectations format, or in your employer's format. Without a written agreement and a shared picture of the employee’s goals, success for the employee is unlikely. During preparation and goal setting, you need to make how you will evaluate the employee’s performance clear. Describe exactly what you’re looking for from the employee and exactly how you will assess the performance. Discuss with the employee her role in the evaluation process. If your organization’s performance review process includes an ​employee self-evaluation, share the form and talk about what self-evaluation entails. Make sure that you also share the performance review format with the employee, so she is not surprised at the end of the performance review time period. A significant component of this evaluation discussion is to share with the employee how your organization will assess performance. The employee needs to understand that if he does what is expected, he will be considered a performing employee. In some organizations that rank employees, this is the equivalent of a three on a five-point scale. An employee must do more than just perform to be considered an outstanding employee. Avoid the horns and halo effect in which everything discussed in the meeting involves positive and negative recent events. Recent events color your judgment of the employee’s performance. Instead, you are responsible for documenting positive occurrences such as completed projects, and negative occurrences such as a missed deadline, during the entire period of time that the performance review covers. In some organizations, these are called critical incident reports. Ask the employee to do the same so that together you develop a comprehensive look at the employee’s performance during the time period that your discussion covers. Solicit feedback from colleagues who have worked closely with the employee. Sometimes called 360-degree feedback because you are obtaining feedback for the employee from his boss, coworkers, and any reporting staff, you use the feedback to broaden the performance information that you provide for the employee. Start with informal discussions to obtain feedback information. Consider developing a format so that the feedback is easy to digest and share with the manager. If your company uses a form that you fill out in advance of the meeting, give the performance review to the employee in advance of the meeting. This allows the employee to digest the contents before her discussion of the details with you. This simple gesture can remove a lot of the emotion and drama from the performance review meeting. Prepare for the discussion with the employee. Never go into a performance review without preparation. If you wing it, performance reviews fail. You will miss key opportunities for feedback and improvement, and the employee will not feel encouraged about his successes. The documentation that you maintained during the performance review period serves you well as you prepare for an employee's performance review. If needed, practice approaches with your Human Resources staff, a colleague, or your manager. Jot notes with the main points of feedback. Include bullet points that clearly illustrate the point you plan to make to the employee. The more you can identify patterns and give examples, the better the employee will understand and be able to act upon the feedback. When you meet with the employee, spend time on the positive aspects of his or her performance. In most cases, the discussion of the positive components of the employee’s performance should take up more time than that of the negative components. For your above average performing employees and your performing employees, positive feedback and discussion about how the employee can continue to grow her performance should comprise the majority of the discussion. The employee will find this rewarding and motivating. No employee’s performance is completely negative—if so, why does the employee still work for your organization? But, don’t neglect the areas that need improvement either. Especially for an underperforming employee, speak directly and don’t mince words. If you are not direct, the employee will not understand the seriousness of the performance situation. Use examples from the whole time period covered by the performance review. The spirit in which you approach this conversation will make the difference in whether it is effective. If your intention is genuine, to help the employee improve, and you have a positive relationship with the employee, the conversation is easier and more effective. The employee has to trust that you want to help him improve his performance. He needs to hear you say that you have confidence in his ability to improve. This helps him believe that he has the ability and the support necessary to improve. Conversation is the keyword when you define a performance review meeting. If you are doing all of the talking or the meeting becomes a lecture, the performance review is less effective. The employee will feel as if he was yelled at and treated unjustly. This is not how you want employees feeling as they leave their performance reviews. You want an employee who is motivated and excited about his ability to continue to grow, develop, and contribute. Aim for performance review meetings in which the employee talks more than half of the time. You can encourage this conversation by asking questions such as these. What are your hopes for your achievements at our company this year? How often would you like to receive feedback? What kind of schedule can we set up so that you don't feel micromanaged, but I receive the feedback that I need as to your progress on your goals? What would be a helpful agenda for our weekly one-on-one meetings? If you take these performance review tips to heart and practice these recommendations in your performance review meetings, you will develop a significant tool for your management tool bag. 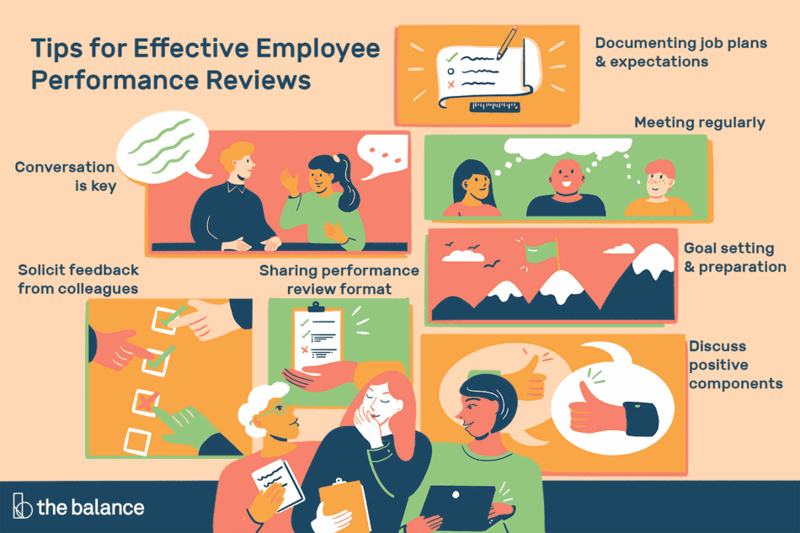 The performance review can enhance your relationship with employees, improve performance for your organization, and enhance employee-manager communication significantly—a boon for customers and work relationships.